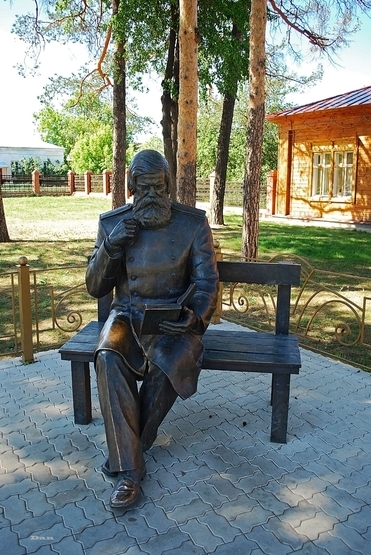 First monument in Russia to outstanding scientist-neuropathologist, organizer and manager of Psychoneurological Institute and Institute of human brain in St. Petersburgh, Vladimir Bekhterev, was opened on January 26, 2007 in the town Elabuga on the day of 150 years since the birth day of great countryman – native of village Sorali (Bekhterevo) of Elabuga district. Authors of the monument are sculptors from Moscow Alexander Golovachev and Vladimir Demchenko. In front of the house there is an old log cabin, inside it first in Tatarstan Museum of Provincial medicine of Bekhterev is located.